“Injuries are unfortunately an unavoidable part of boxing and it is just the nature of the business,” reasoned the WBO Intercontinental champion. “There is nothing anybody can do about it and I am just happy that a good replacement has been lined up for me. The charismatic 27-year-old, who carries explosive speed and power, faces his latest and most challenging audition yet against former European champion Mehdi Amar at the Morningside Arena in Leicester on February 23, live on BT Sport. An impressive victory over an opponent who has suffered only one early finish – in his fourth fight due to injury – and was only defeated on points by the formidable now world champion Oleksandr Gvozdyk last year, will likely lead the WBO towards mandating the 17-0 Yarde to challenge the winner of this weekend’s rematch between Eleider Alvarez and Sergey Kovalev. Yarde, who has been happy to bide his time up to now, suspects himself that his moment of world title truth is looming closer. “I have said to myself when the time comes I have got to be ready,” said the WBO Intercontinental champion. “Sometimes they say it is energy, that you can feel things and I can feel it getting closer so I am pushing myself to the limit, literally, in trying to become a better fighter. “I am trying to digest information in the best way I can, I am trying to become a better technical fighter who is more explosive, more powerful, more relaxed. Every aspect I am trying to work on. Yarde, along with his trainer-manager Tunde Ajayi, undertook a scouting mission back in August for the original Kovalev-Alvarez encounter in Atlantic City and witnessed first-hand the toppling of the Russian known as Krusher. He views targeting the winner of the sequel as a logical sequence of events. “Most definitely,” added the strapping six footer. “These are the world champions and I’ve always said it doesn’t matter who the champion is, I have just got to be ready for when I get to that stage. I am very nearly at that stage now, I am ranked No.1 by the WBO and No.8 in the world by BoxRec, so that is a very big position – top ten in the world after 17 fights. So will Yarde, who doesn’t study boxing religiously, be tuning into BoxNation to see if Kovalev can recapture former glory against Alvarez? “I might watch Alvarez-Kovalev, but I won’t be watching it to see what they are doing because I try not to watch my opponents to see what they are doing well. “If you consistently watch a possible opponent you start to worry about what they do well. I just need to worry about what I do. I’ve seen Kovalev fight a few times – before I was even a professional – so I know what he is about and I know he is slowing down, although he has still got the power, obviously. 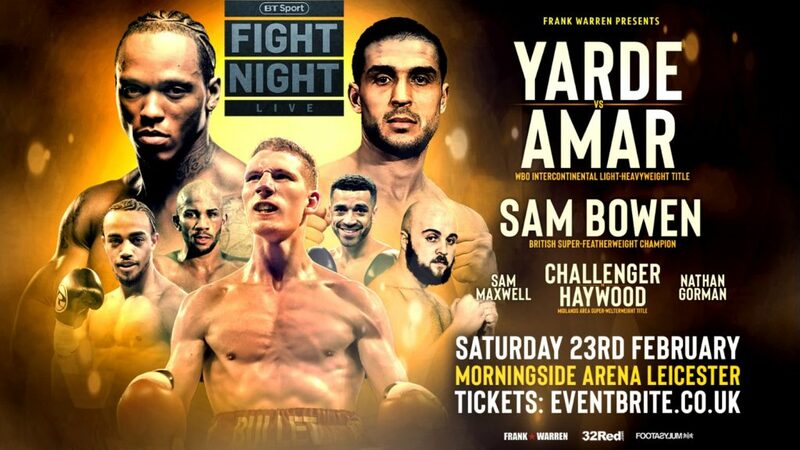 Anthony Yarde’s defence of his WBO Intercontinental light heavyweight title against Mehdi Amar at the Morningside Arena shares top billing with the British super featherweight champion Sam ‘Bullet’ Bowen. Local fighters CJ Challenger and Kyle Haywood do battle for the vacant Midlands Area super welterweight title, with Nathan Gorman, Lyon Woodstock, Ryan Garner, Willy Hutchinson, Tommy Fury, Ryan Hatton and Mark Chamberlain also featuring on the card. PLEASE find below quotes from today’s press conference for Frank Warren’s big card at Leicester’s Morningside Arena on Saturday February 23, live on BT Sport. Amar, who has been stopped only once in 2012, moved on to challenge for the WBC Interim world light heavyweight title against the formidable Ukrainian Oleksandr Gvozdyk – recent conqueror of Adonis Stevenson with a perfect 16-0 record – in March of 2018 at Madison Square Garden. The 27-year-old’s bludgeoning power and blistering speed has seen to it that only one – in his second fight as a pro – of his opponents has heard the final bell, resulting in him being ranked No.1 contender in the WBO rankings. “I am aiming for big things this year and it starts here,” stated Yarde. “Amar possesses all the experience and know-how of operating at a high level, winning European titles and fighting some of the best in the division. 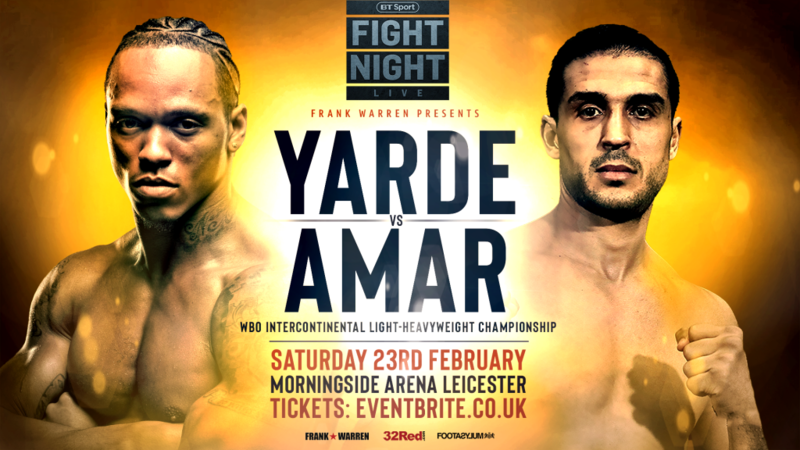 Yarde’s clash with Amar at the Morningside Arena shares top billing with the British super featherweight title showdown between the champion Sam ‘Bullet’ Bowen from Ibstock in Leicestershire and Ronnie ‘The Shark’ Clark from Dundee. Local fighters CJ Challenger and Kyle Haywood do battle for the vacant Midlands Area super welterweight title, with Nathan Gorman, Lyon Woodstock, Ryan Garner, Willie Hutchinson, Tommy Fury, Ryan Hatton and Mark Chamberlain also featuring on the card. 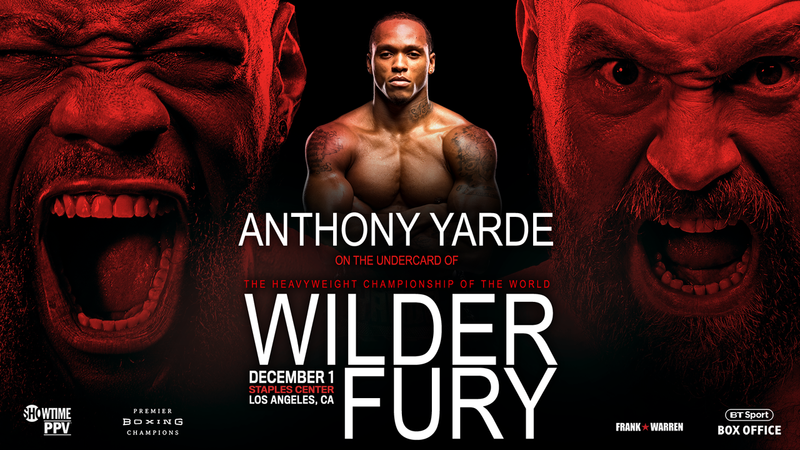 ANTHONY YARDE HAS landed himself a spot on the biggest night of boxing in 2018, with the self-styled ‘Beast from the East’ set to fight on the huge Deontay Wilder-Tyson Fury card at the Staples Center on December 1. The 17-0 (16KOs) WBO Intercontinental and European champion will have his 18th professional contest in Los Angeles on the undercard of the huge heavyweight collision between the WBC world champion and the unbeaten lineal champion of the division. It will represent a second stint of Stateside experience for the explosive Yarde, following on from his 2016 venture to the AT&T Stadium in Texas where he bludgeoned Rayford Johnson in the first round on the night of Liam Smith’s defence of his WBO world super welterweight title against Saul Alvarez. 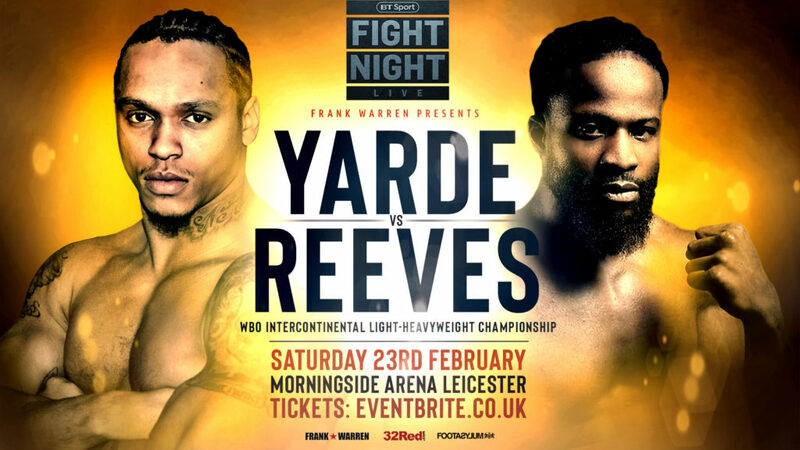 “I’ve experienced the fight scene in the USA before and it is something I cannot wait to sample it again,” commented Yarde. “To be a part of such a huge occasion really will be something else and it will only inspire me to create nights like this for myself in the future. Tunde Ajayi added: “Myself and Anthony have worked tremendously hard and it is a privilege and honour to be involved in the biggest card in boxing, period. “I just feel that it is a position we have both worked hard for and it just shows you that if you put one in you get one back and if you put two in you get two back. We’ve put a lot into the sport since before Anthony came into professional boxing and from that point to where we are now has been constant work. The following are the weights and the running order for the Brentwood Centre on Saturday night. The show is live on BT Sport 3 from 7:30pm, then crosses over to BT Sport 1 at 8.45pm. Remaining tickets are available to purchase on the door. 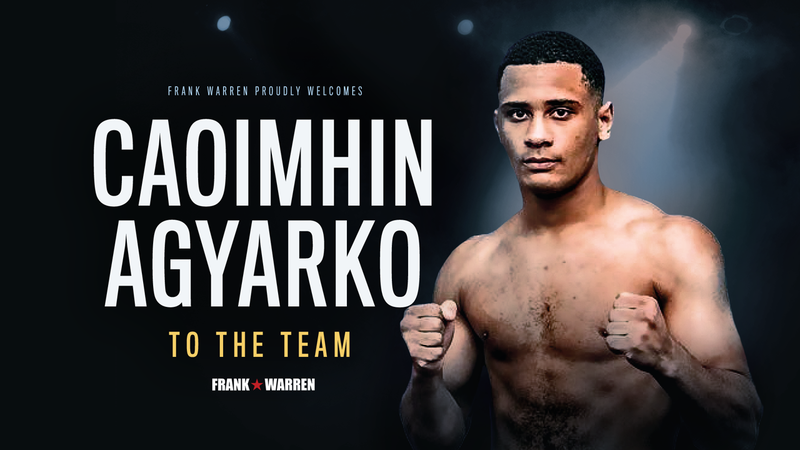 Debut making middleweight Caoimhin Agyarko firmly believes he has made the right decision in removing himself from the home comforts of Belfast and swapping it for the leafy environs of Bromley in order to properly kickstart his professional career, which gets underway at the Brentwood Centre on Saturday. The 21-year-old – who was born in Croydon and is currently residing with family in South Norwood – learned his craft at the Holy Trinity Boxing Club in his home city, but is now being tutored in the professional arts by respected trainer Alan Smith at the thriving iBox Gym in the former Kentish town. “My plan was always to move away from Belfast once I turned professional, or was seeking to turn pro,” explained Caoimhin, which is pronounced Kee-van . “I think over here there is more sparring, coaching and stuff, so I wanted to get away and get a better opportunity than I would just staying in Belfast. “I will still be living in Belfast though because I will just be based in Bromley for camps,” he added, before agreeing that working away from home at such a tender age will only increase his mental resolve. “That is it because nothing in life comes easy and, if you want to do great things, you have to take yourself out of your comfort zone. I always knew from a young age that I would want to get away to make sure there would be no distractions, not that there would be. “I think taking myself away to London for camps for six to eight weeks at a time will test me mentally and I will be able to focus better and put in the work more than I would back home. It was a guest appearance for the World Series Boxing team, Italia Thunder, that propelled Caoimhin towards taking the professional plunge. Even though the Italians lost the tie 3-2, a fourth round stoppage of Hong Sik Kee Clement set tongues wagging and the Belfast boy ended his amateur tenure in style. “I had roughly 130-140 amateur fights including all my internationals. To me, my amateur time was not unbelievable, but I had a good amateur career. I won six national titles, including a senior title, which is like winning the ABAs. I won the Ulster Seniors when I was 17 and I have boxed for Ireland 30-40 times, going to the worlds and Europeans. “My last amateur bout was for the Italia Thunder in the WSB, where I had an unbelievable fight and put on a good performance. I think that fight got me the recognition that I needed. Caoimhin suggested that he will bring a bit of everything to the professional ranks and insists that he is much more than just a big punch. “A lot of people think because I am small and stocky and look big, that I am just a big puncher. It is not the case, I’ve a great boxing brain, I think, and I am good with my footwork and being able to adapt in fights. “It just depends, everyone has their own style and I would say I am an aggressive counter puncher. I go forward and back and it just depends who my opponent is on the night. “I have fast hands and I have power. I have a bit of everything and that is why coming to Al was such an easy decision for me because he is such a good coach and I wanted someone who can improve me. 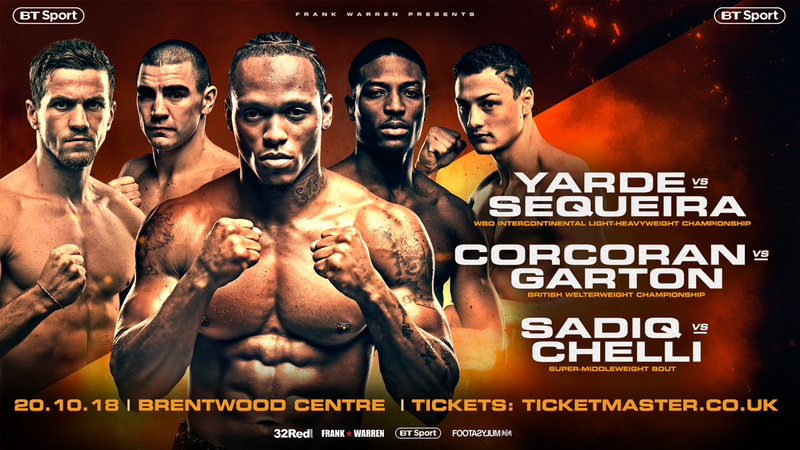 Anthony Yarde will be headlining the Brentwood Centre on October 20th when he faces Argentinian Walter Gabriel Sequeira. World title challenger Gary Corcoran and Johnny Garton will contest the vacant British welterweight title. Zak Chelli and Umar Sadiq will both be putting their young, undefeated records on the line in a super-middleweight contest. Heavyweight Nathan Gorman will also feature along with IBF European Middleweight Champion Joe Mullender on the show televised live on BT Sport. Remaining tickets are available at the Brentwood Centre box office or via calling the Queensberry Promotions Box Office on 01992845710. 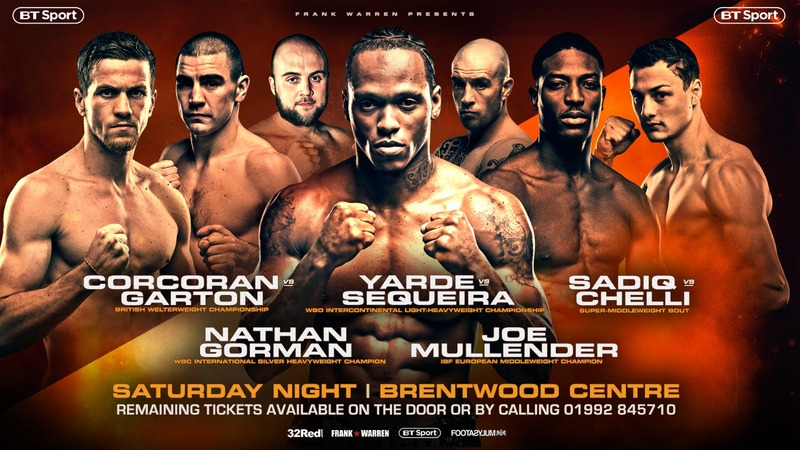 ANTHONY YARDE headlines the bill at the Brentwood Centre on Saturday when he defends his WBO Intercontinental Light-Heavyweight title against Argentina’s Walter Gabriel Sequeira. Wembley traveller Gary Corcoran and Peckham’s Johnny Garton contest the vacant British welterweight title on another top Frank Warren card, live on BT Sport. Two of Britain’s top super-middleweight prospects Umar Sadiq and Zak Chelli meet over eight rounds. Chelli won a toss of the coin to be in the home corner. Unbeaten heavyweight prospect Nathan Gorman is also in action. Here are a selection of quotes from yesterday’s press conference. “This is part of Anthony’s education moving forward. I am told by his management that Walter fancies the job. Regarding Frank Buglioni, we offered over £100,000 and he did not want to know. This is about Anthony moving up the rankings. Johnny Garton and Gary Corcoran are two tremendous competitors and it will be something special. What you see is what you get and it will be a good fight. Zak and Umar is a pick ‘em and both called for it. Whoever wins will go on quickly and it will not be the end for the loser. It is tough matching Nathan up. He is one of the most underestimated boxers in Britain and one of the most improved. The job Ricky Hatton has done is amazing. If he keeps moving forward, we will see some fight between him and Daniel Dubois next year. I could fight for a world title and win it, but it is about getting to that stage and staying there. I had 12 amateur fights and just 16 professional fights so I am inexperienced. I want ten years in boxing and I have been professional for three years, so with seven years left there is no rush. My talent has to be improved in all areas. Boxing is not a sport where you can be at a low level at all. I’m confident and when you have power like me, it relaxes your nerves. People complain about my opponents, but Walter is ranked above every other British rival apart from Callum Johnson. The Joshua Buatsi fight can build. If he is as confident as I am, it is a big event down the line. Anthony is a very good boxer, but I am well prepared and cancelled a fight in September to take this. Anthony has few weaknesses, but I have got a surprise in store on Saturday. I always face bigger men and this will not be a problem. I have experienced this. I have boxed at a way higher level and I am confident of winning. I have better experience and beaten better boys, but I have to show it on the night. I can either outbox him or have a fight. It is up to me what happens on the night. Either way I beat him. It has been a long road to become mandatory and earn my shot. I have been on small halls fighting 50-50 fights and when I have had to step up, I have won. I didn’t think I’d make it as a pro and thought I might get to Southern Area level. Gary is a great fighter. He is very tough and I like him, but that goes out of the window. We are going to meet head on. To win the British title it would mean the world to me. “Umar is basic and simple and like an amateur. His prime was 26 and he is now 30. He just acts like a kid. I learned a lot as an amateur and boxed in Olympic Qualifiers, what did he do as an amateur? I respect every man who will get in the ring. I see videos of him knocking grown men over, but I fail to see what he can do to me. I am going to outbox him – simple as that. Each round I keep on learning, but winning is the main thing. I have been sparring Hughie Fury and that is the next best thing to fighting. Daniel Dubois did what he had to do against Kevin Johnson and got the ten rounds, but there was no offence from Johnson. Daniel is good at the basics. I am good at the opposite and I am wrong for him. I beat him easily. 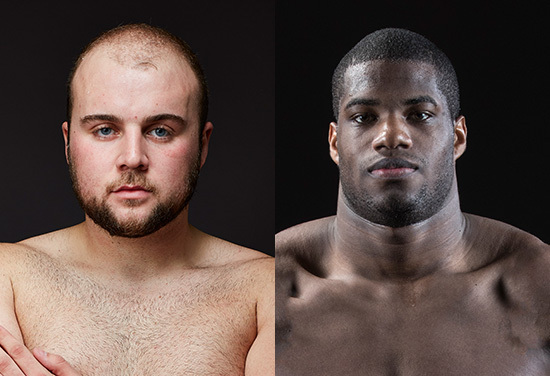 DANIEL DUBOIS insists the time is getting closer for a showdown with arch domestic rival, Nathan Gorman. A mouthwatering clash between two of the best heavyweight prospects in the world is one to look forward to. Gorman’s trainer Ricky Hatton revealed earlier this week that his man is desperate to face his former sparring partner and GB amateur team-mate. Dubois who has won all nine professional fights, eight by KO, is also keen adding: “Me and Gorman is a good a fight and I want to have that fight when the time is right. “A few fights down the line we can have that fight, definitely. It sounds a great fight. Hatton hoped that Dubois would be ringside at the Brentwood Centre on Saturday (October 20) to see unbeaten Gorman bid for his 14th consecutive professional win. Instead Dubois will be tuned into BT Sport watching his biggest rival, right now. The Londoner who is back in the gym on Monday following his win over Kevin Johnson earlier this month said: “I am having some time off just chilling at home. Dubois was taken the distance for the first time in his career by former world title challenger Johnson in a great learning fight in Leicester against the American survivor. “I have done it. It is gruelling doing ten rounds and now we move on. “I have just got to improve. There are things to work on when I go back in the gym and I also have to work on strategy. “The biggest thing I learnt from the Johnson was that I have to stay focused for the whole round and be prepared for anything. He gave me a good workout.